Retirement brings a great many changes to a person’s life, especially their finances. One of the things that new retirees often look at is whether the credit cards they currently have are still suited to their new lifestyle and income level or whether they should look into getting new and different credit cards that offer more to enhance their life after work. 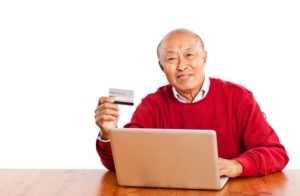 Here is a little information about some of the best credit cards for retirees – whatever you intend to do with your time now. Many people plan all of their working lives that when they do not have to worry about the 9 to 5 grind anymore that they will visit some of the places that they have always dreamed that they would. And whether that means a week in Paris or a exotic jungle safari having the right credit card with you can make a big difference. One of the problems with many credit cards when you are using them abroad are the foreign transaction fees that are attached to many of them. A great many credit cards charge cardholders these fees each and every time they make a purchase abroad, and however small they may seem on the face of things those 2% to 3% add ons can really add up over the course of even a single vacation abroad. That is just one of the reasons why the Venture Rewards Credit Card is a really great card to have in your wallet when you are traveling internationally. The card does not have any foreign transaction fees attached to it all something that until very recently was unique in the US credit card industry (a few more larger lenders – Citi and Chase have recently followed suit) but the Capital One Venture Rewards Credit Card does not even gouge you at the ATM, charging the same fees as they would if you were getting a cash advance from an ATM a block away from home. Regular use of the Capital One Venture Rewards card at home can help reduce your international travel costs as well. If you spend $1,000 on the card (on anything) in the first three months, you’ll earn 10,000 bonus miles that can be used whenever you want. You also earn 1 bonus mile for every dollar spent, whether you are at home or abroad. There is a $59 annual membership fee attached to the card but it is waived for the first year. Retirement is also a great time for catching up with friends and family at home, especially if those people live elsewhere in the country. If you are planning to spend time cross country traveling them you may want to look for a credit card that will reward you while you do that as well as score you a few extra discounts and perks as you travel. One such card is the AARP Rewards VISA Card. Available (as you will have guessed) only to those who are over 50 this credit card offers unlimited cash-back on every purchase but the standard 1% cash back rate rises to 3% when you use the card to pay for any travel related expenses – including restaurant meals, car rental, filling up at the gas station and hotel and/or motel stays. In addition all purchases earn 5% cash back for the first six months of card membered as well as 0% APR on purchases and balance transfers for twelve months. For many people retirement is a time for cutting expenses as their new fixed income is not quite as good as it was when they were still working. Switching to a credit card with no annual membership fee or a lower interest rate can be one way of doing that fairly easily, at least when it comes to your credit card spending. There are several credit cards that are particularly good in this regard but one the very best is the Simmons Bank Platinum Visa. You do have to have pretty good credit to get this credit card but if you can qualify for it you are rewarded with a credit card that has a super low 7.25% interest rate and no annual membership fee. There may be no fancy rewards program attached to this credit card but as a basic credit card for everyday use it is a really great choice. These are just a few of the credit cards that are really the best ones for retirees to have in their wallets, there are quite a few more. Before you change your credit cards and credit card habits after retirement spend some time doing a little research and comparison shopping to match the various credit card offerings to the way you intend to spend your new free time.